After the infamous meltdown in 1986 resulted from a flawed reactor design and poor training, other nuclear reactors at the Chernobyl facility continued to operate until the turn of the century. For the past 18 years, Chernobyl has been nothing but an abandoned wasteland due to the high level of radiation, making the Chernobyl exclusion zone unsuitable for agriculture or forestry. This exclusion zone is a 1000 square mile area around the Chernobyl nuclear plant mostly uninhabited and unused since the 1986 disaster. 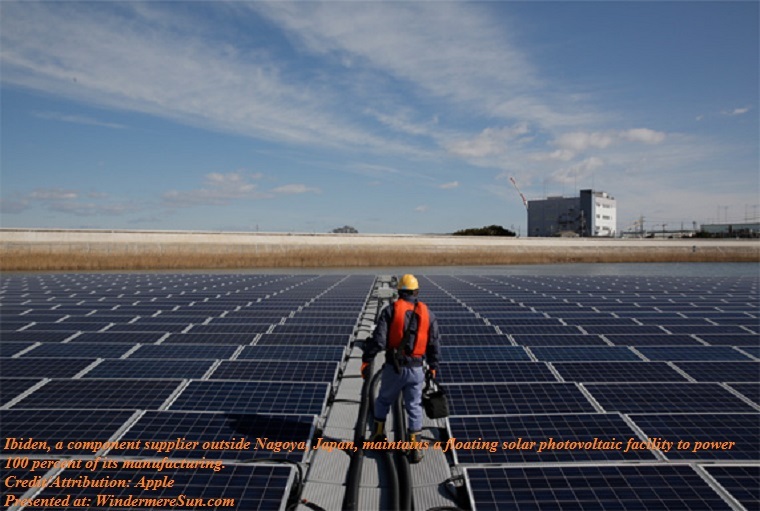 Since there is already substantial electrical infrastructure in place left over from the nuclear plant and the fact that the land is unused and cheap, the site is an excellent choice for large solar farm(s) to be installed. Between January and September of this year (2018), more than 500 MW of renewable power capacity is added to Ukraine, more than twice as much as in 2017, according to the Ukrainian government.The head of the Office of the National Investment Council of Ukraine, Yulia Kovaliv, said investors want to reap the benefits from a generous subsidy scheme before parliament is due to vote on scrapping it in July next year. “Investors expect that in the renewable energy sector facilities launched before 2019 will operate on the current beneficial system of green tariffs…that is why investors want to buy ready-to-build projects in order to complete construction before that time.” Yulia Kovaliv told Reuters reporter on the sidelines of a conference in Odessa in September. Cheap land and sunny skies are attracting interests from around the world. Two Chinese companies, GCL System Integration Technology Co. Ltd. and China National Complete Engineering Corp, are also building a one-gigawatt solar power plant (enough to power 100 million LED bulbs) to the South of Chernobyl. 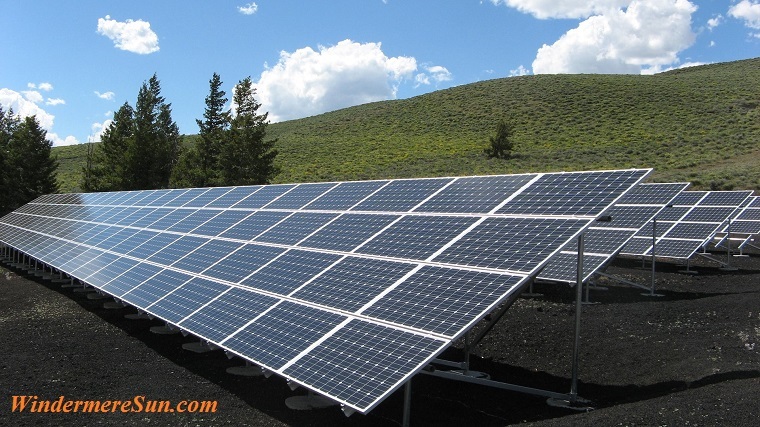 Another dozen smaller investors are also installing solar parks nearby on a smaller scale. These entrepreneurs are not deterred by the challenges of major construction projects in nuclear contamination zone. Engineering work has already begun, but there has not been any public disclosure about safety measures, the completion date, nor a price for the project. Hurricane Florence was a Category 4 at its peak, at 130 miles per hour (or 210 kilometers per hour) wind two days before making its landfall on September 14, 2018. That was so close to the threshold (140-160 miles per hour) of the design of new solar farms. 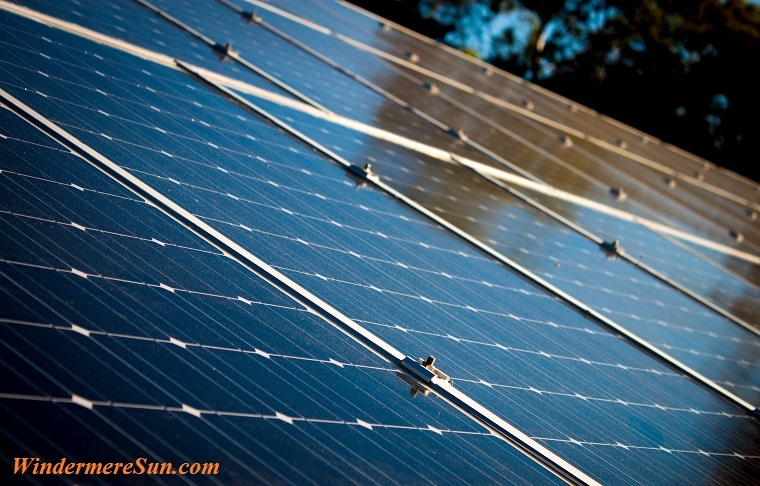 About a third of the 3,000 megawatts of solar capacity connected to Duke Energy Corp’s system went down initially, according to utility spokesman Randy Wheeless. As of this week, about nine projects in North Carolina remained offline. Four of these were due to damage to Duke Energy facilities and five were due to damage to the project themselves. Wheeless said facilities that suffered the most tended to be five megawatt projects connected to Due’s distribution system. Duke had been trying to get developers to move toward larger solar projects to connect largely to its transmission system, the high-voltage wires that link Duke plants to the distribution system that delivered power to homes and businesses. With hundreds of solar projects connected to Duke’s grid in North Carolina, the number of damaged projects remained small. Senior vice president at Strata Solar, Brian O’Hara, said that the Chapel-Hill based solar developer with more than 140 projects in the state saw damage at only two facilities. O’Hara said, “Duke has done a commendable job responding quickly and getting our facilities back online shortly after we notified them that they were inspected and ready to reconnect….our teams have coordinated closely with Duke’s recovery team, and it has been professional, responsive and pretty seamless.” The chief operating officer for Durham-based Ecoplexus Inc., John Morrison, said his company also saw very little damage, with only two of the 16 sites operating in North Carolina suffering some broken modules, amounting to less than 0.34% of the the developer’s modules, “not enough to even exceed the insurance deductible.” Spokesman for the California-based Cypress Creek Renewables, Jeff McKay, also reporting no notable damage in its solar fleet. As for Duke itself, its only project that suffered damage was the 60-megawatt Monroe Solar project in Union County, with few panels being damaged by wind. Duke’s Fayetteville, Warswa and Camp Lejeuene solar projects were all undamaged and returned to service as soon as grid operations allowed. Most outages during and after the worst of the hurricane Florence were due to problems with Duke’s grid rather than problems at the projects themselves. This week, Windermere Sun is devoting several posts on how some of the individuals, groups, or companies commit to help combat climate change and to create a healthier environment. Back in April of this year (2018), Apple announced its global facilities being powered with 100% clean energy. This was achieved through retail stores, offices, data centers and co-located facilities in 43 countries, including the United States, the United Kingdom, China, and India. Apple also announced nine additional manufacturing partners committed to power all of their Apple production with 100% clean energy, bringing the total number of supplier commitments to 23. Apple and its partners are building new renewable energy projects around the world, improving the energy options for local communities, states and even entire countries. 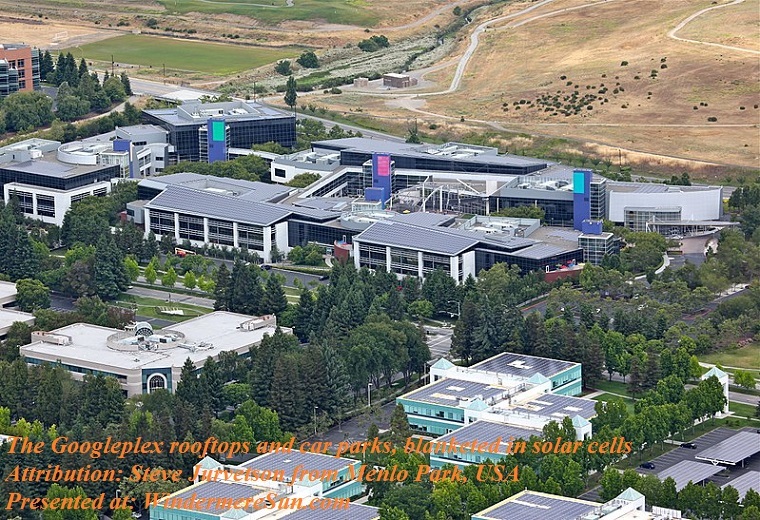 Apple creates or develops, with utilities, new regional renewable energy projects that would not otherwise exist. These projects represent a diverse range of energy sources, including solar arrays and wind farms as well as emerging technologies like biogas fuel cells, micro-hydro generation systems and energy storage technologies. Apple currently has 25 operational renewable energy projects around the world, totaling 626 megawatts of generation capacity, with 286 megawatts of solar PV generation coming online in 2017, its most ever in one year. It also has 15 more projects in construction. Once built, over 1.4 gigawatts of clean renewable energy generation will be spread across 11 countries. Since 2014, all of Apple’s data centers have been powered by 100 percent renewable energy. And since 2011, all of Apple’s renewable energy projects have reduced greenhouse gas emissions (CO2e) by 54 percent from its facilities worldwide and prevented nearly 2.1 million metric tons of CO2e from entering the atmosphere. 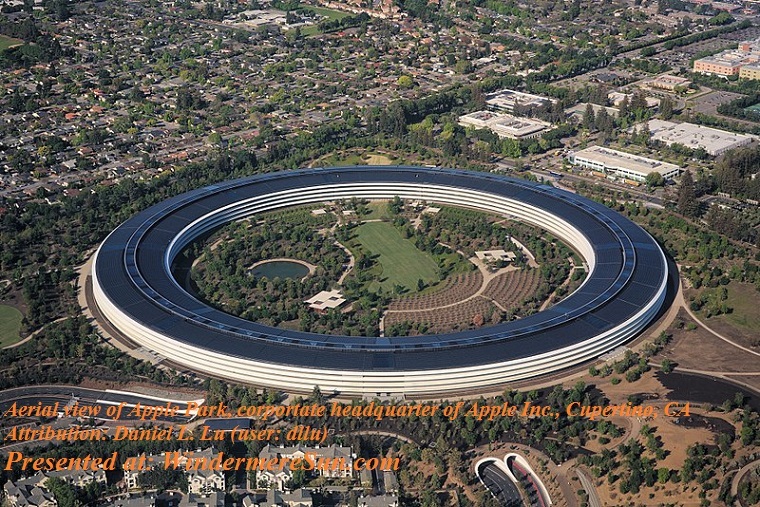 Apple Park, Apple’s new headquarters in Cupertino, is now the largest LEED Platinum-certified office building in North America. It is powered by 100 percent renewable energy from multiple sources, including a 17-megawatt onsite rooftop solar installation and four megawatts of biogas fuel cells, and controlled by a microgrid with battery storage. It also gives clean energy back to the public grid during periods of low occupancy. Over 485 megawatts of wind and solar projects have been developed across six provinces of China to address upstream manufacturing emissions. Apple recently announced plans to build a 400,000-square-foot, state-of-the-art data center in Waukee, Iowa, that will run entirely on renewable energy from day one. In Prineville, Oregon, the company signed a 200-megawatt power purchase agreement for an Oregon wind farm, the Montague Wind Power Project, set to come online by the end of 2019. In Reno, Nevada, Apple created a partnership with the local utility, NV Energy, and over the last four years developed four new projects totaling 320 megawatts of solar PV generation. In Japan, Apple is partnering with local solar company Daini Denryoku to install over 300 rooftop solar systems that will generate 18,000 megawatt-hours of clean energy every year — enough to power more than 3,000 Japanese homes. Apple’s data center in Maiden, North Carolina, is supported by projects that generate 244 million kilowatt-hours of renewable energy per year, which is equivalent to the energy used by 17,906 North Carolina homes. In Singapore, where land is scarce, Apple adapted and built its renewable energy on 800 rooftops. Apple is currently constructing two new data centers in Denmark that will run on 100 percent renewable energy from day one. To get to 100 percent renewable energy for its own facilities, the company worked to set an example for others to follow. Apple also announced that 23 of its suppliers are now committed to operating on 100 percent renewable energy, including nine new suppliers. Altogether, clean energy from supplier projects helped avoid over 1.5 million metric tons of greenhouse gases from being emitted in 2017 — the equivalent of taking more than 300,000 cars off the road. In addition, over 85 suppliers have registered for Apple’s Clean Energy Portal, an online platform that Apple developed to help suppliers identify commercially viable renewable energy solutions in regions around the world. Arkema, a designer of high-performance bio-based polymers, which manufactures for Apple at its facilities in France, the United States and China. DSM Engineering Plastics, which manufactures polymers and compounds in the Netherlands, Taiwan and China that are used in many Apple products, including connectors and cables. ECCO Leather, the first soft goods supplier to commit to 100 percent clean energy for its Apple production. The leather that ECCO produces for Apple is of European origin, with tanning and cutting occurring at facilities in the Netherlands and China. Finisar, a US industry-leading producer of optical communication components and vertical-cavity surface-emitting lasers (VCSELs), which power some of Apple’s most popular new features like Face ID, Portrait mode selfies and Animoji. Luxshare-ICT, a supplier of accessories for Apple products. Luxshare-ICT’s production for Apple is predominantly located in Eastern China. Pegatron, which assembles a number of products, including iPhone, at its two factories in Shanghai and Kunshan, China. Quadrant, a supplier of magnets and magnetic components in a number of Apple’s products. 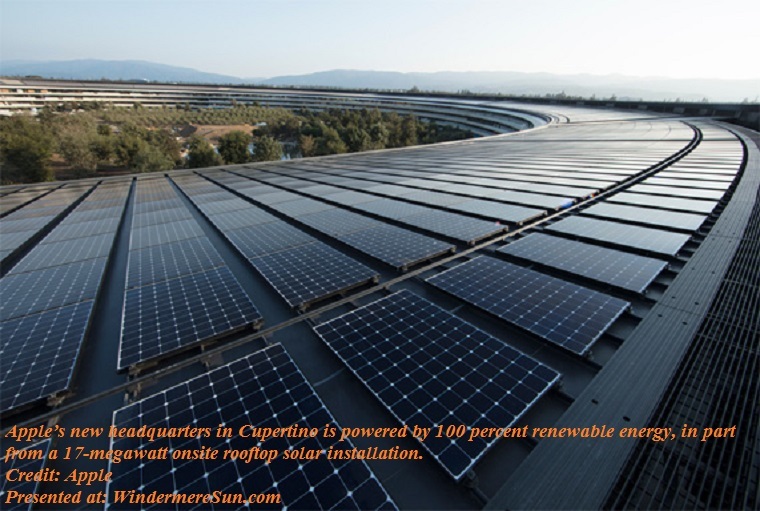 Quanta Computer, one of the first Mac suppliers to commit to 100 percent renewable energy for Apple production. Taiyo Ink Mfg. Co., which produces solder masks for printed circuit boards in Japan. If Not Now, Then When Should We Talk About Climate Change? Vote “NO” On Amendment 1 In November !!! Governor Scott, Can You Really Wish This Away?! Hurray! Tesla Model 3 Is Finally Here! The post below is a re-post from our sister publication, Windermere Sun (www.WindermereSun.com). Today, California has become the first U.S. state to require solar panels on nearly all new homes and low-rise apartment buildings, starting in 2020. The California Energy Commission voted 5 to 0 to approve the new building standard/requirement that residential buildings up to three stories, including single-family homes and condos, be built with solar panels installations starting in 2020. About 117,000 new single-family homes and 48,000 multi-family units will be built in 2020. 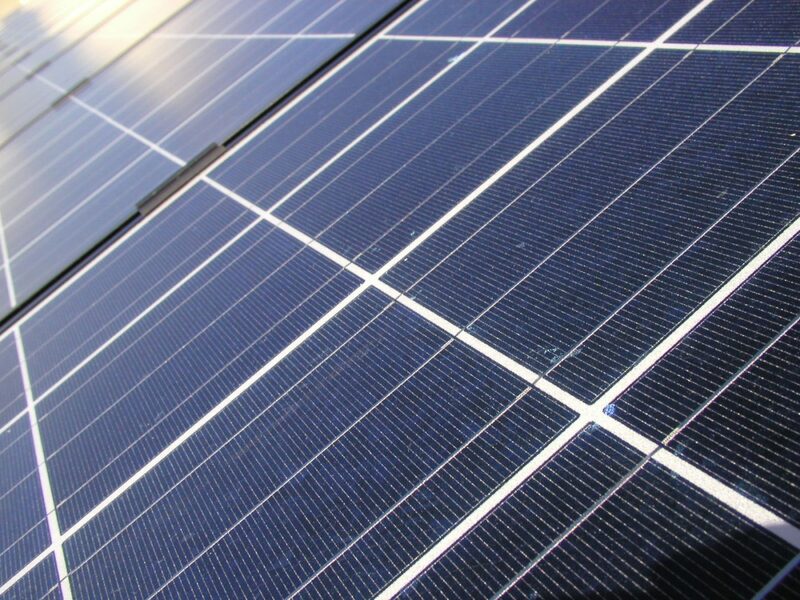 The commission endorsed this requirement after building representatives, utilities, and solar manufacturers and advocates voiced their support. It still needs the final approval from California’s Building Standards Commission (which usually adopts the energy panels’s recommendations when updating the state’s building codes). This is California’s latest step to curb greenhouse gas emissions. 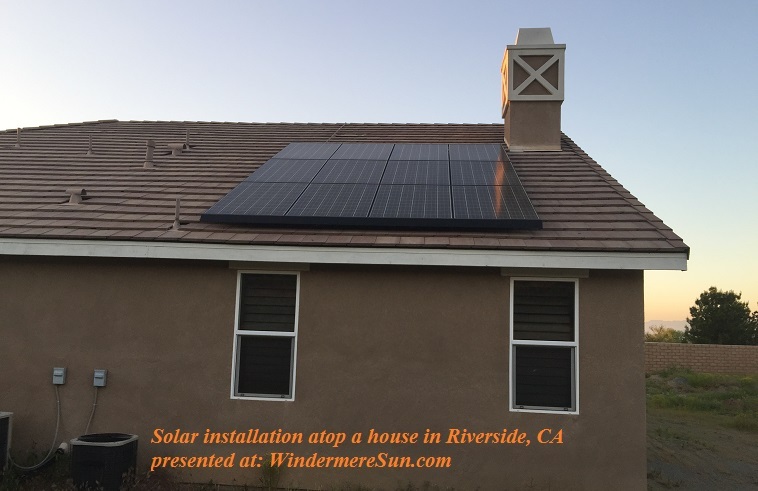 The technical director for the California Building Industry Association Robert Raymer called it a “quantum leap.”This requirement would only be applied to newly constructed homes, although many homeowners are choosing to install rooftop solar panels with help from various rebate programs. The California Energy Commission estimated that adding solar panels would boost construction costs by $9,500 for a single-family home but save homeowners about $19,000 in energy cost and other expenses over 30 year period. The price of solar has dropped dramatically in recent years, therefore, it is a no-brainer that it is cost effective for all homeowners to install solar. The amount of solar power required by the new standards is minimal and not enough to meet all the energy needs of most homes, therefore, most homes would still have to draw some of their power use from the power grid. 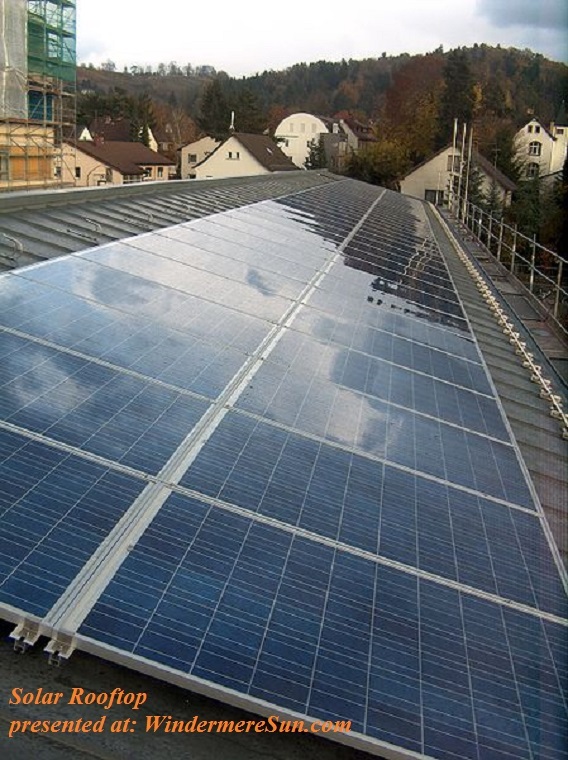 The regulations exempts solar panels installations when it is not cost-effective or feasible (such as for homes shrouded in shade). Community solar generation would be an option for such circumstances. According to SEIA (Solar Energy Industries Association), California is already the nation’s leader in solar installation, with more than 5 million homes in the state using solar power. California has set the goal of all residential buildings being “zero net energy”, meaning producing as much energy as they consume. California has positioned itself as the leader for clean energy in USA, pushing more electric vehicles on the roads and lower emissions from homes and commercial buildings. Perhaps it is high time for rest of the 49 states to also follow the California lead, for it is both economical and environmentally friendly for homeowners to install solar. (This is an article that helps to remind us why we need to Go Solar, Renewable, and EV). 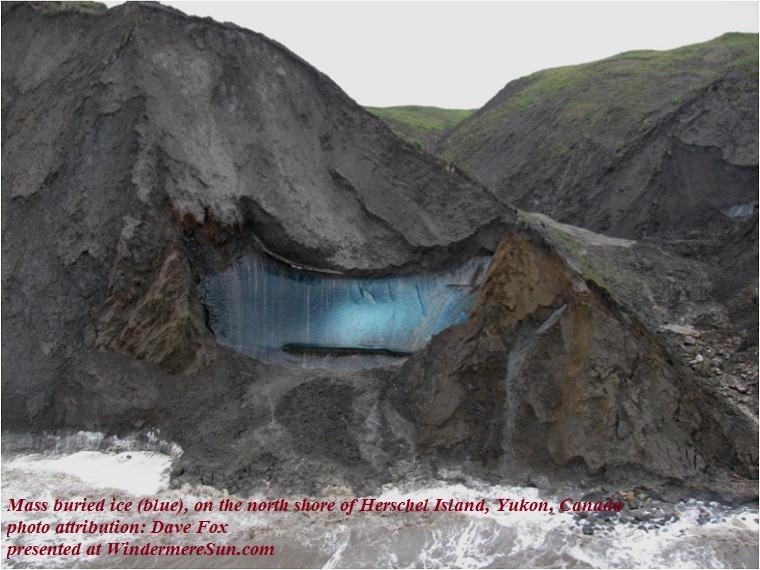 We’ve known for a long time that thawed Arctic permafrost would release much powerful greenhouse gases. Scientists estimated that five times as much carbon might be stored in frozen Arctic soils—permafrost—as has been emitted by all human activities since 1850. This worries people who study global warming. 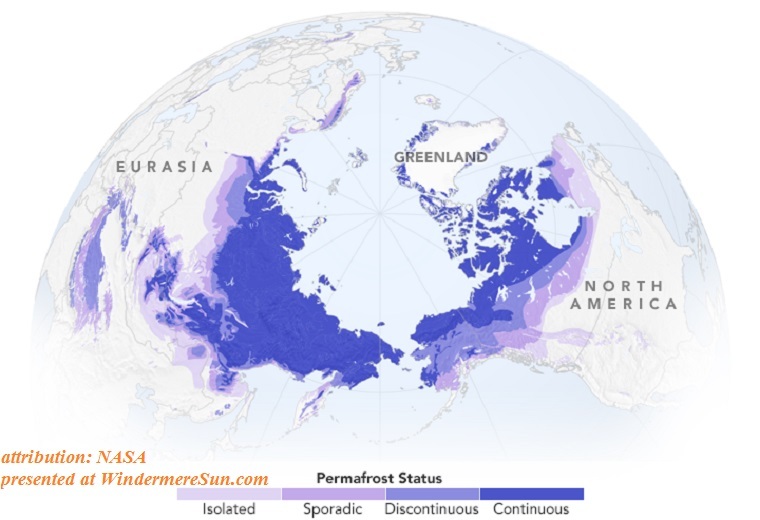 While emissions from permafrost currently account for less than 1 percent of global methane emissions, some researchers think this could change in dramatic ways as the world warms and that carbon-rich frozen soil breaks down. 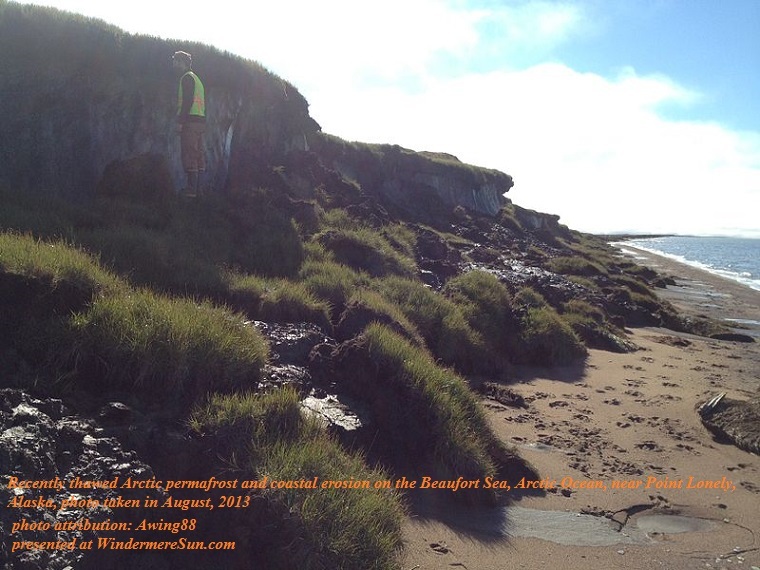 Today, U.S. scientists and researchers revealed the discovery of permafrost in the northern hemisphere storing massive amounts of natural mercury (a potent neurotxin), a finding with significant implications for human health and ecosystem worldwide. 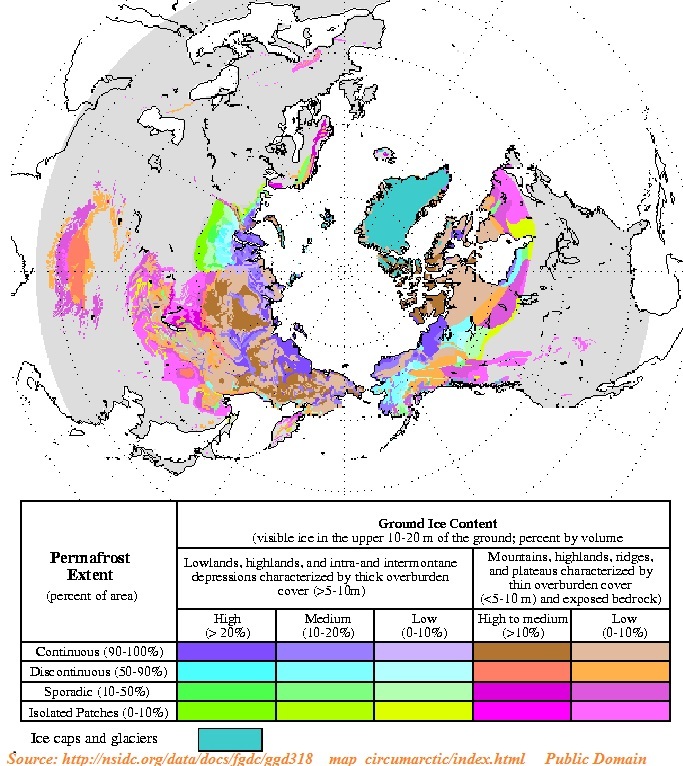 In geology, permafrost is ground, including rock or (cryotic) soil, at or below the freezing point of water 0 °C (32 °F) for two or more years. 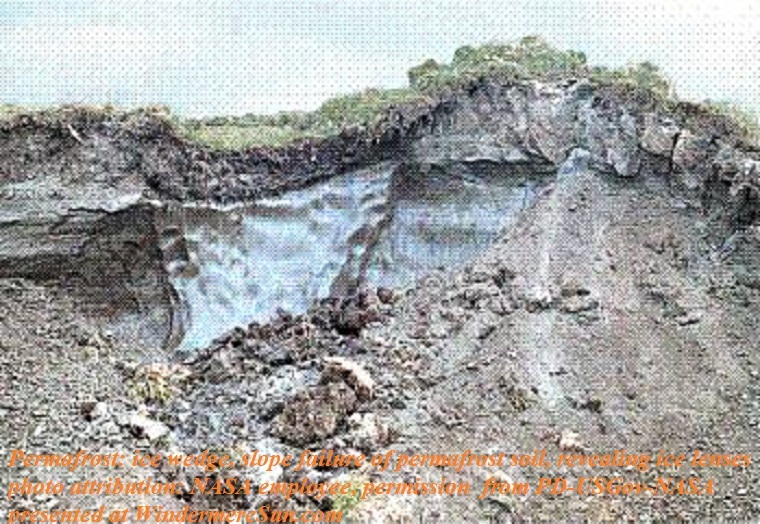 The Arctic’s frozen soil of permafrost also acts as a massive ice trap that keeps carbon in the ground instead of in the atmosphere. 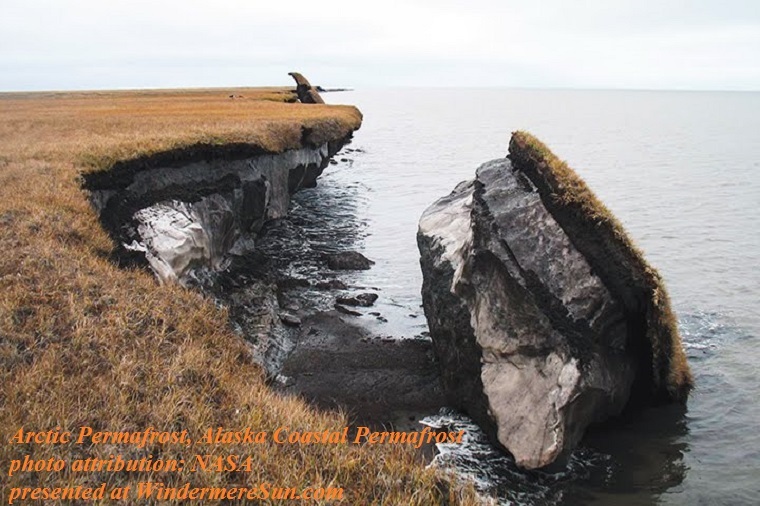 There are 32 million gallons worth of mercury (or the equivalent of 50 Olympic swimming pools) trapped in the permafrost, according to the scientists who published the study in the journal Geophysical Reserach Letters, a journal of the American Geophysical Union. 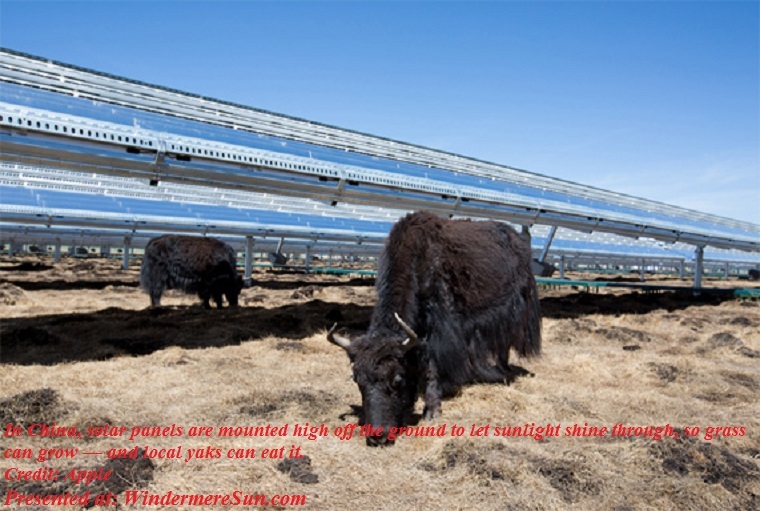 Cutest Solar Power Plant On Planet Earth Is In China! Duke Energy IS Shifting From Nuclear To Solar! Yes, this is the year to celebrate the Bridgestone World Solar Challenge’s 30th Anniversary in Australia! The event began on Sunday, Oct. 8, 2017, at State Square, in front of the Parliament House of Northern Territory (at 6:00 am-8:30 am, with the first car leaving at 8:30 am) and expect to see the solar car teams arriving at Victoria Square/Tarntanyangga of Adelaide, Australia (between Wednesday, Oct. 11 to Sunday, Oct. 15, 2017). After teams of students from 30 countries designed and built their own solar cars, they have traversed 3,000 km between Darwin and Adelaide in 5-8 days, to meet the challenge of 3 classes of World Solar Challenge of 2017: Challenger Class; Cruiser Class; and Adventure Class. World Solar Challenge was the brain child of solar pioneer Hans Tholstrup and car racer Larry Perkins. In 1982, they embarked on a quest to drive a home-built solar car The Quiet Achiever across Australia from West to East. Hans also enthusiastically urged others to explore and develop solar transport. So, the World Solar Challenge was born. 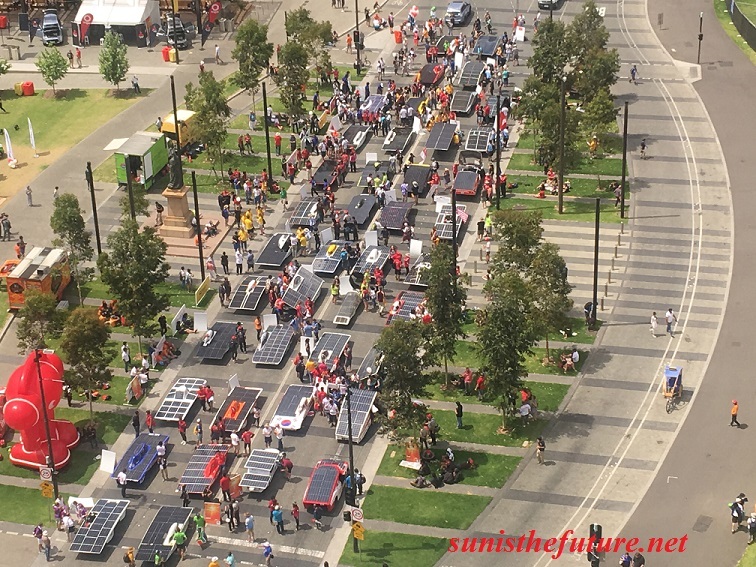 Inaugurated in 1987 with pioneer sponsor, the South Australian Tourism Commission, the World Solar Challenge continues to showcase the development of advanced automotive technology and promote alternatives to conventional vehicle engines. Using no more than six square meters of solar panels, bright young minds from different parts of the world are on track in developing efficient solar powered electric vehicles. Every two years, teams from international universities and technical institutes gather with private entrepreneurs at Down Under to promote the knowledge and fact that sun/solar is the future. Above are photos and videos from World Solar Challenge 2015. Keep in mind that these solar car teams will be arriving tomorrow Thursday, Oct. 12, 2017, at Victoria Square/Tarntanyangga, Adelaide, Australia. If you will be near Adelaide, check out Victoria Square for views of many interesting designs of solar cars. To find out the updated result for all teams and all classes and to see all the solar cars at World Solar Challenge 2017, please click HERE. To find all the supportive Scientific Faculty behind World Solar Challenge, please click HERE. For Regulations of the 2017 Bridgestone World Solar Challenge, please click HERE. For World Solar Challenge web site, please click HERE. For more on healthy, happy, and sustainable living, please feel free to visit: Windermere Sun, www.WindermereSun.com, an online publication promoting community activities, businesses, and collaborations for healthy, happy, and sustainable living. 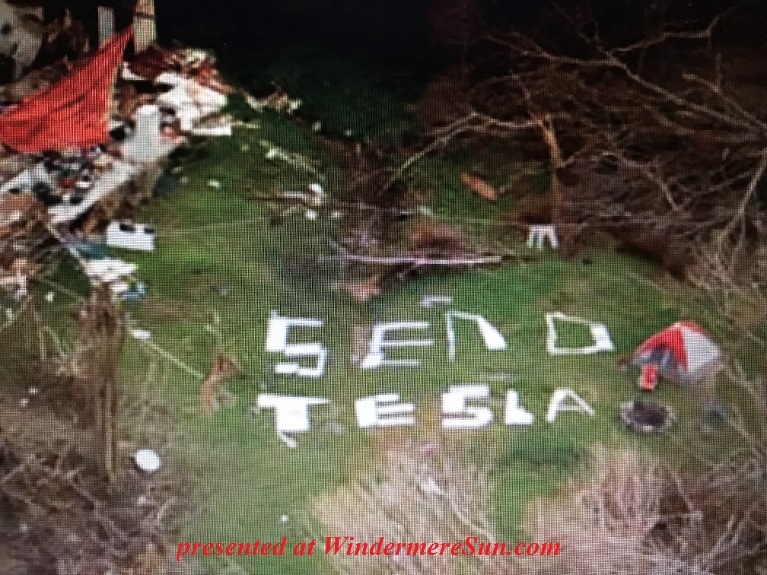 Within two weeks after Hurricane Irma swept over St. John (smallest of the three main U.S. Virgin Islands), a survivor used debris from a nearby home to spell out “SEND TESLA“. With significant loss of life, lack of drinking water, dehydration, food scarcity, and disappearing power grid in Puerto Rico, the humanitarian effort by Tesla stepping in to help was truly welcomed. Bloomberg reported that Tesla had been sending hundreds of its Powerwall battery systems to be paired with solar panels to help restore the power back to the battered island. The monumental destruction brought by hurricanes Irma and Maria on the U.S. Virgin Islands and Puerto Rico in September is opening up the possibilities for companies such as Tesla to move in and establish a presence. Tesla sent representatives to the island to begin signing up survivors for solar services. Tesla indicated that some of the systems (Tesla Powerwall+Solar Panels) are already in Puerto Rico and others are on their way. Bloomberg also reported, “The company (Tesla) has employees on the ground to install them and is working with local organizations to identify locations.” The Puerto Rico island is still mostly without without power. Thanks to Tesla for bringing power/electricity back to some of the people of Puerto Rico and U.S. Virgin Islands. Mia Farrow’s Twitter further reminds us of the BBC report of 55% of the people in Puerto Rico are without drinking water. Hopefully, President Trump’s visit tomorrow (Tuesday, Oct. 3, 2017) to Puerto Rico will bring more attention, help, and water being dropped in by the U.S. National Guard to these Americans at Puerto Rico. The vision of Elon Musk, once a simple sketch in Musk’s blog back in August of 2013, will soon become a reality. At the speed of 760 mph, this high speed mode of transport would allow commuters to travel between Orlando and Miami in 26 minutes or between Los Angeles and San Francisco in 30.15 minutes (twice as fast as commercial air travel). It is truly enabling us to travel at a blink of an eye. 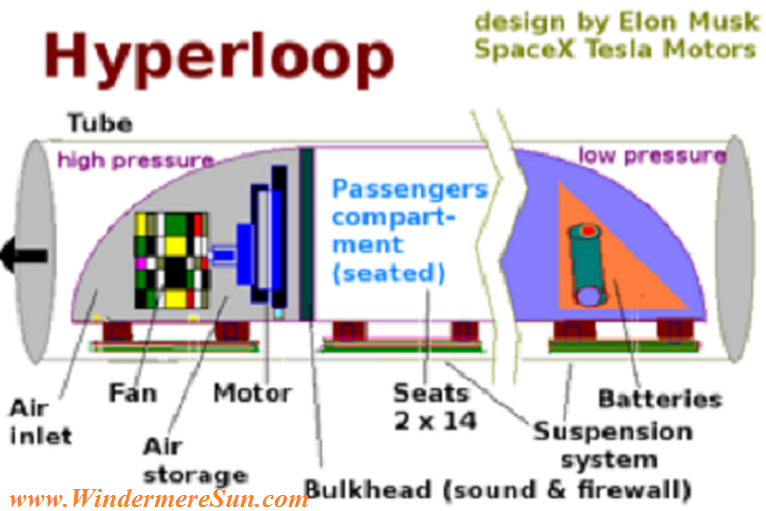 As an alternative to boats, aircrafts, automobiles, and trains, Elon Musk’s vision was that of hyperloop transporting people (and cars) via electromagnetically levitated pods/capsules enclosed inside of steel low-pressure tubes. Musk described the design looking like a shotgun with the tube running side by side for most of the journey and closing the loop at either end. The tube is partially evacuated to reduce friction. The capsule or pod carriage rides on a cushion of air forced through multiple openings at the capsule’s bottom (as though capsules are suspended midair by air casters, think of pucks on air hockey table float around ), further reducing friction. The capsules would be propelled (accelerate or decelerate) by linear induction motors (which are magnetic) placed at intervals along the route. These tubes would be mounted on columns 50 to 100 yards apart and the pods or capsules inside would travel up to 760 mph. Finally the hyperloop vehicle itself contains air compressor near the front to intake excess air in the tube and exhaust in the back because excess air would cause resistance and drag that would slow down the vehicle. Since Elon Musk has made the hyperloop design/technology open source, there had been multiple governments, universities, companies worldwide exploring this concept . Hyperloop One, launched in 2014, previously known as Hyperloop Technologies, is a company in Los Angeles, California, that is working to commercialize the Hyperloop for moving passengers and/or cargo at airline speeds at a fraction of the cost of air travel. 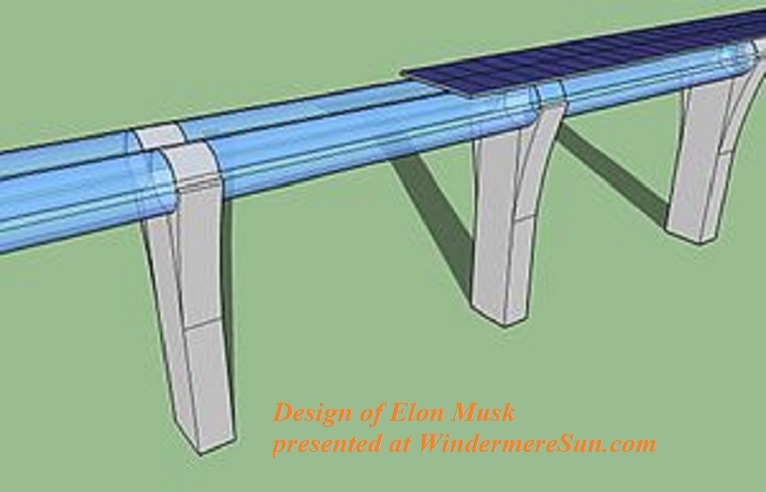 The concept of Hyperloop transportation was introduced and named by Elon Musk in August 2013, although he is not directly involved with Hyperloop One. The company has raised $160 million and demonstrated a form of propulsion technology in May 2016 at its test site north of Las Vegas. Its new round of funding on September 21, revealing an additional $85 million received from investors such as DP World, Caspian VC Partners, WTI, and OurCrowd.com. So, in total, Hyperloop One has raised $245 million since its launch in 2014 and is now worth more than $700 million. Hyperloop One has completed a 500m Development Loop (DevLoop) in North Las Vegas and just after midnight on May 12, 2017, the company held its first full-scale Hyperloop test, becoming the first company in the world to test a full-scale Hyperloop. The test combined Hyperloop components including vacuum, propulsion, levitation, sled, control systems, tube, and structures. Hyperloop One is currently developing passenger and cargo system routes in the United States, Canada, Finland, Sweden, the Netherlands, and the United Arab Emirates. It is also in early talks with Indian government to build one in India. Its publicly stated goal is to deliver a fully operational Hyperloop system by 2021. Officials with Hyperloop One placed the Florida route on a list of 10 that had cleared an initial proposal review. Each of the cities will now receive resources to help develop feasibility studies for the regions. We will be expecting wonderful collaborative efforts and new mode of transportation in the 2020’s. Our world is getting smaller, mostly due to innovations, open source, and great collaborations. 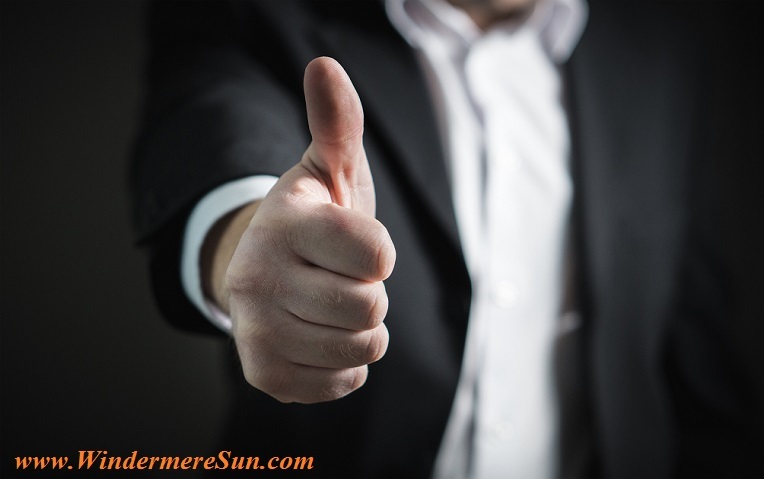 Below is a re-post from our sister publication, Windermere Sun. 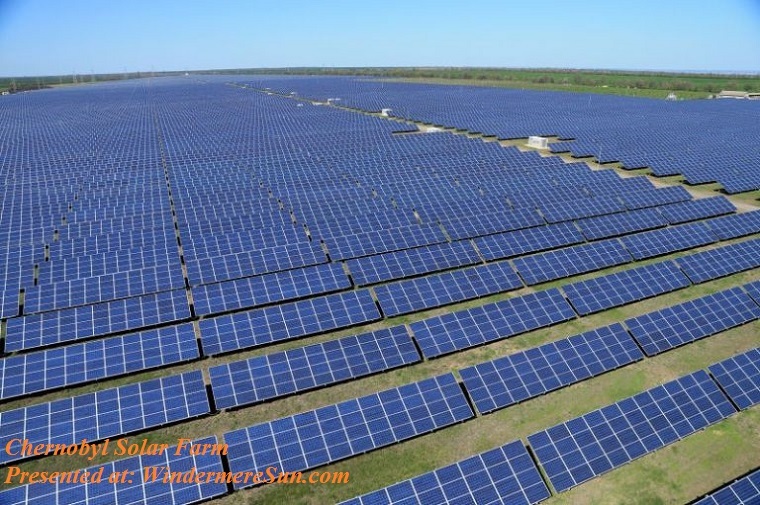 What fantastic news for solar enthusiasts, climate scientists, and environmentalists! On Tuesday of this week, Duke Energy of Florida announced a settlement with Florida’s Public Service Commission (PSC), equivalent to other states’ Public Utility Commission (PUC), to stop plans to build a nuclear power plant in western Florida. The utility, with the blessing from PSC, will instead invest $6 billion in solar panels, grid-tied batteries, grid modernization projects, and electric vehicle charging stations. This new investment plan will involve the installation of 700 MW of solar capacity over four year period in the western Florida region. Duke Energy Florida may not have started building the Levy nuclear power plant, but it did have plans to order two AP1000 reactors from Westinghouse. 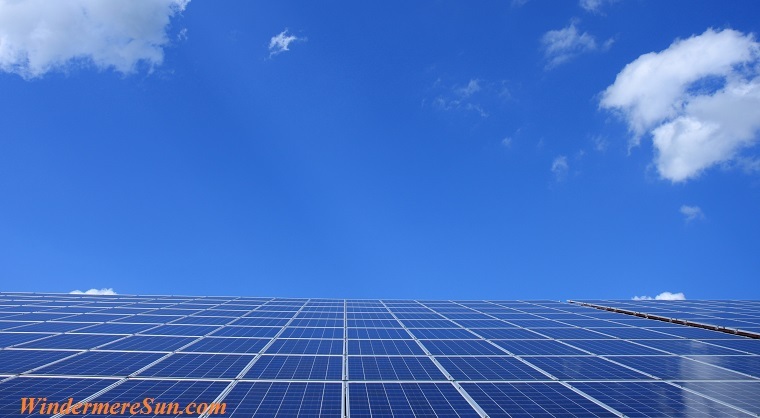 But now, with the dramatic decrease in cost of solar and increase in battery storage technology, Florida utility concluded that it is much more cost effective to invest in solar rather than nuclear. Last week, Duke told its PSC that it would have to increase rates by more than 8% due to increased fossil fuel (coal and natural gas) costs. But with the new investment plan directing the utility toward solar and storage, that rate hike will be 4.6% instead of 8%. Even though the preparatory expenditure on Levy are now sunk costs, this new plan will save residential customers future nuclear related rate increases. Customers will see a cost reduction of $2.50 per MWh (megawatt-hour) through the removal of unrecovered Levy Nuclear Project costs, according to the utility. The 700 MW of solar may not cover the 2.2 GW (gigawatt) capacity of the Levy plant, but it does indicate the dramatic shift from nuclear power to more solar power. Duke Energy of Florida serves 1.8 million Floridians and had been relying heavily on natural gas. This week Duke said it wants to raise its solar power capacity to 8% generating power in the next four years. The parent company of Duke Energy Florida, Duke Energy, also pulled the plug on another planned nuclear power plant in North Carolina last week, according to GreenTechMedia. With continuing drop in solar cost and improved battery storage technology, it is conceivable that Duke would choose the best option of increasing solar for its customers. It is a turning point in the history of energy use, when utility and PSC are able to be weaned from nuclear and move onto solar. Thanks to those who have worked tirelessly in researching, developing, and improving battery storage technology. For this is necessary in order for solar to be promoted from intermittent to reliable source of power. Below, is a re-post from one of our sister publications, Windermere Sun. 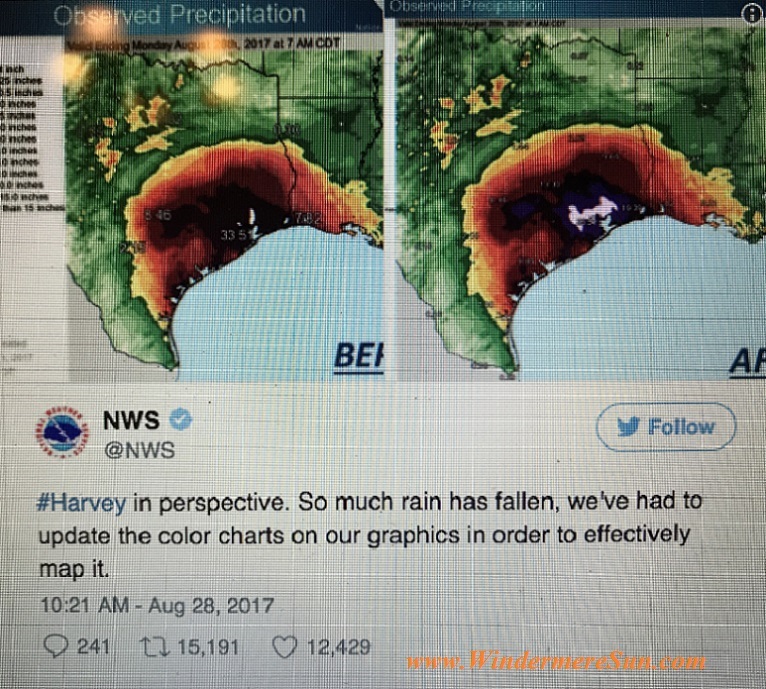 With water and massive damage of Hurricane Harvey continue to rise, and the death toll from the storm reaching 30, the National Weather Service (NWS) had to add a new color purple to indicate the unprecedented rainfall level that has occurred during the Storm/Hurricane Harvey since its landfall at Rockport, TX, on last Friday. NWS added two purple shades to its map because the old scale topped out at more than 15 inches while the new limit tops at 30 inches. Even though this is the most powerful storm that has hit Texas in more than 50 years and the worst flooding disaster in U.S. history, many experts and meteorologists believe that climate change will continue to fuel massive storms like Hurricane Harvey in the future. As Houston is experiencing its third 500-year flood in 3 years and 25 separate 500-year floods have occurred across the USA since 2010, it is conceivable that this will be our new normal. Below, you will find an interview by Amy Goodman of Democracy Now and discussion with David Helvarg, Executive Director of Blue Frontier, an ocean conservation organization, on the subject of how climate change is fueling massive storms such as Hurricane Harvey. David Helvarg comments that these flood zones will become more water logged as the sea level rises at Texas and Louisiana coast, South Florida, etc. The prediction is such that there may be about 3-6 feet or more of sea level rise in the coming decades, with the continuing global warming. The two 10,000 year rain events in two years is becoming the new normal. Despite the Trump administration’s denial of climate change, there are many measures that individual states and cities may take in helping to slow down the climate change: installing more renewables such as solar and wind, transitioning into electric vehicles, reducing food waste and increasing local food productions, recycling, reusing, reducing, etc. There had been more than 1,200 people who died amid flooding in Bangladesh, Nepal, and India. This year’s monsoon season has brought torrential downpours that have submerged wide swaths of South Asia, destroying tens of thousands of homes, schools, and hospitals and affecting up to 40 million people. Aid organizations are warning that this is one of the worst regional humanitarian crises in years, with millions of people facing severe food shortages and disease caused by polluted flood water. Flood victims in southern Nepal say they have lost everything. Below, Amy Goodman of Democracy Now speaks with Asad Rehman, Executive Director of “War on Want“. Director Rehman has worked on climate change issues for over a decade. To see what actions Central Floridians in Orlando (esp. Mayor Dyer and his team) have been pursuing in their effort to slow down the climate change, please view our previous post on Florida Climate Summit at Orlando in August, 2017. 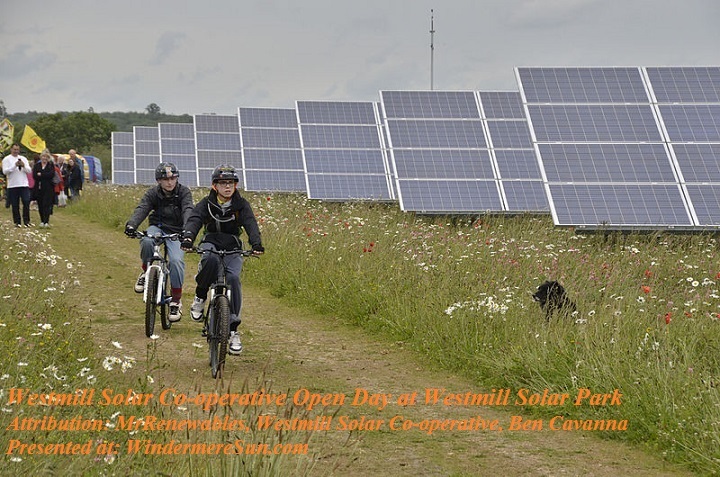 Perhaps you can also initiate and/or encourage people in your communities to transition into renewables such as solar and wind, electric vehicles, recycle, reuse, reduce food waste and increase local food productions. Our home planet Earth is in need of our help. We need to slow down the climate change in order to prevent millions of people on earth becoming homeless.